The Easter weekend was a busy time for me. Lots of family to entertain, lots of chocolate to eat. Actually, I still have lots of chocolate to eat. It's a tough job, but somebody's got to do it! The festivities began when a group of us met up at a little local pub for dinner on Friday night. I finished up getting ready in a bit of a rush, but I still managed to grab a few photos. At this point I would just like to take a moment to thank Topshop for creating the Jamie jean. I used to long for a jean that combined the structure and sturdiness of the Baxter with the sleek, leg-hugging qualities of the Leigh/Joni, and then I discovered the Jamie. It's like they answered my prayers! My leopard print T-shirt is also from Topshop and is a couple of years old. It's made from a silky fabric which gives it a touch of luxe and makes it perfect for dressing up for the evening. A blazer makes everything look a little smarter, as does a sleek pair of heels. 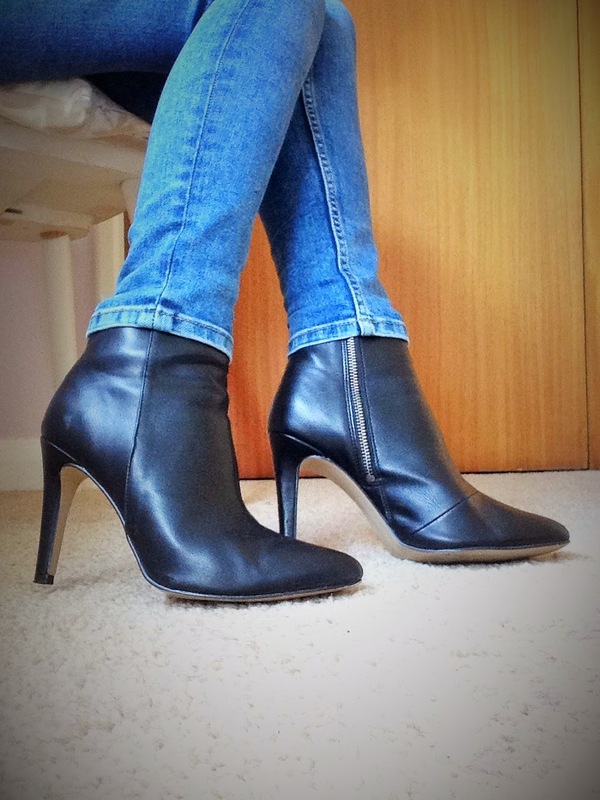 I went for an ankle boot style because we were walking to the pub and it was a bit nippy. I am such a baby when it comes to the cold. As I said, I was in a bit of a rush, so makeup-wise I went for a bold lip. I love a dramatic eye but find them quite difficult to do, so a bold lip is my failsafe for evenings out if I haven't got much time. Face - Estee Lauder Double Wear foundation in Cool Bone, Collection Lasting Perfection concealer in Fair, Rimmel Stay Matte powder in Peach Glow, Bourjois Delice de Poudre bronzing powder. I lightly dusted the bronzer all over to give me a warm glow. I never contour because I have quite prominent cheekbones with natural hollows beneath them. Contouring is not a good look on me, unless it's a fancy dress party and I'm going as a skeleton. Eyebrows - Rimmel Eyebrow Pencil in Black Brown to define the shape, Eyelure Shape and Shade Brow Palette - the darker powder and the wax to set. Eyes - I used an ancient Chanel duo, but essentially it's just a creamy colour all over the lid and a warm mid-brown blended into the crease. I curled my lashes and applied Collection Fat Lash mascara. 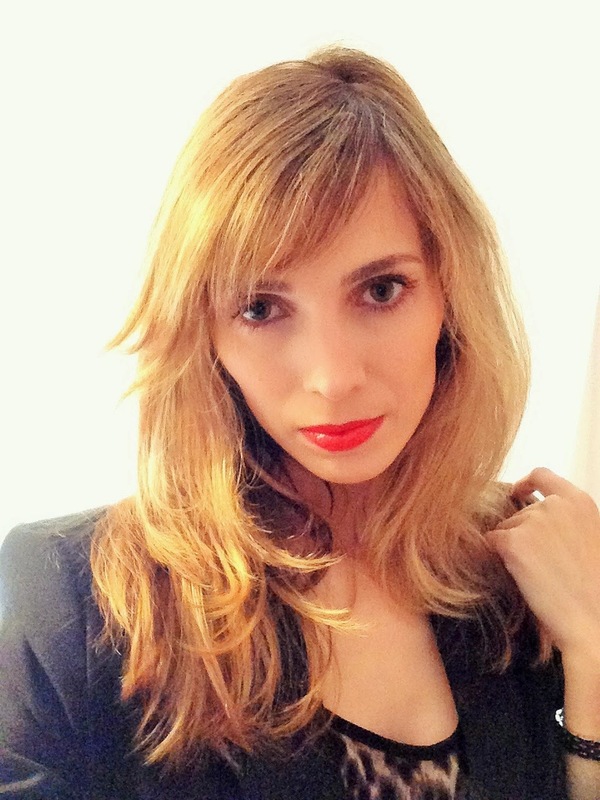 Lips - YSL Rouge Pur Couture in Le Orange, which has been my favourite lipstick for a while now. I fell in love with it when I saw it on Kourtney's lips in Keeping up with the Kardashians a few seasons ago, and as soon as I found out what it was I rushed out to buy it. At £23.50 (at the time) it was the most I'd ever spent on a lipstick, but it was worth every penny. The colour is an amazingly vibrant orange/red and the formula is creamy and a pleasure to apply. I always blot and reapply my lipsticks several times to improve their longevity, and this one stays put beautifully for a night out. We had a lovely dinner in a very loud and lively pub. The food was simple and really good. 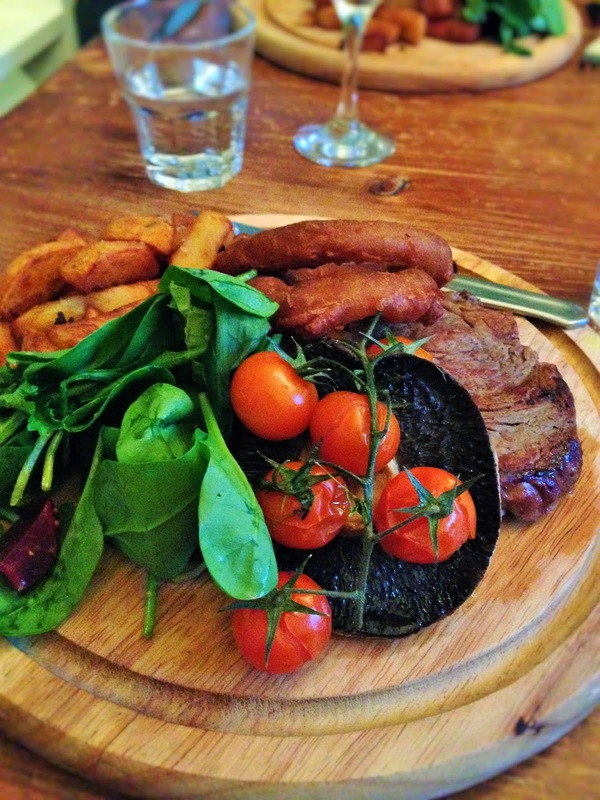 Why settle for a plate of steak and chips when you could have a whole chopping board full? 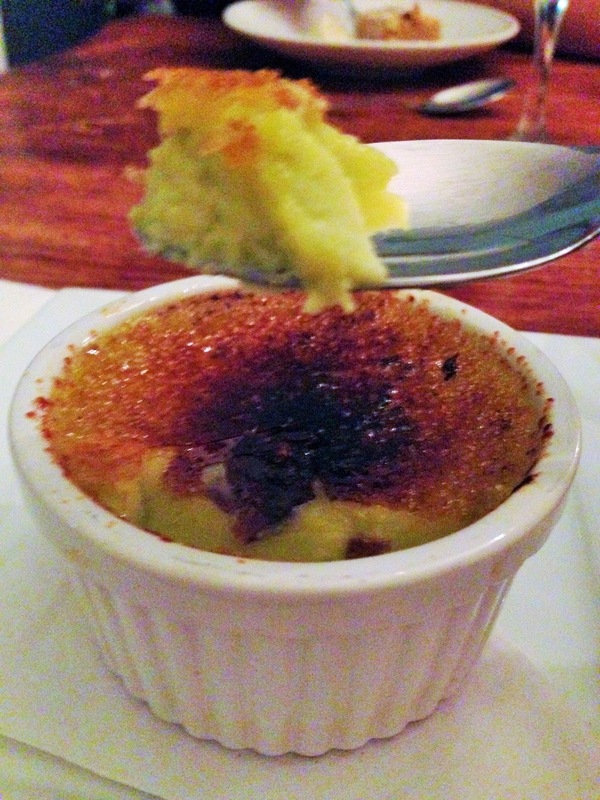 Pistachio-flavoured crème brulee. This was amazing. I hope everyone who celebrates Easter had a great holiday! You look great :) I love the top with the black blazer ! The creme brulee looks divine ! Looking great!! I love your top! Animal prints are evergreen. 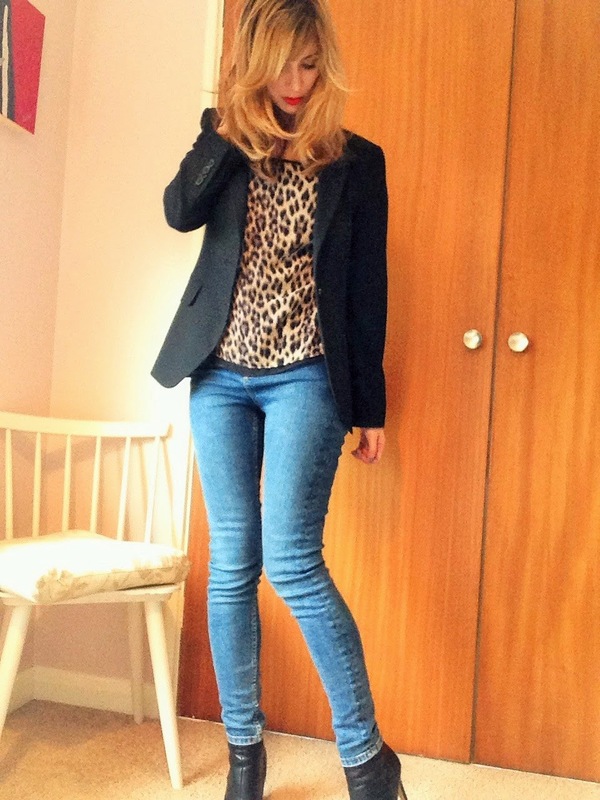 I love a great casual uniform of jeans and a blazer. I love the animal print top. It brings it all together nicely.